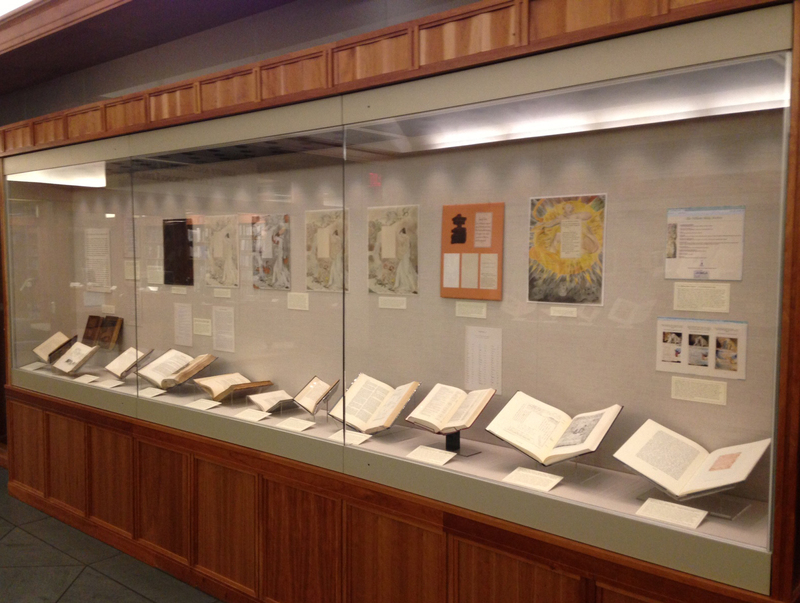 A new exhibition, “William Blake, Visionary / Envisioning William Blake,” is now on view in the Albert and Shirley Small Special Collections Library’s 1st floor exhibition gallery. William Blake (1757-1827) died in obscurity, the genius of his visionary art only imperfectly comprehended by an appreciative few. Nearly two centuries later, however, Blake is universally recognized as one of England’s greatest artists and poets. This two-part exhibition begins by briefly outlining selected aspects of his life and art. The second half traces the fascinating process by which later generations have rediscovered Blake, gathered and disseminated his rare and widely dispersed work, and sought to envision this visionary artist. 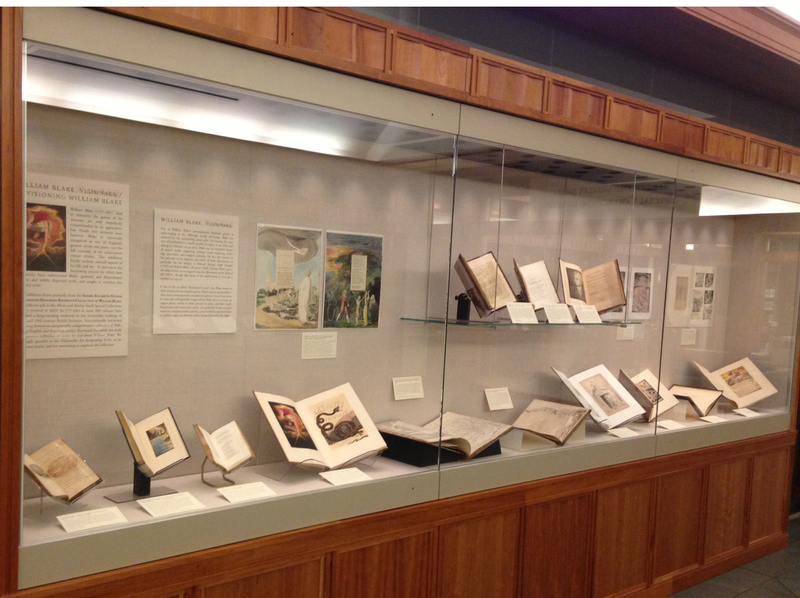 The exhibition draws primarily from the Sandra Elizabeth Olivier and Raymond Danowski Reference Collection of William Blake, a magnificent gift to the Albert and Shirley Small Special Collections Library received in 2010. Its 275 titles in some 400 volumes have remedied a long-standing weakness in our formidable holdings of 18th– and 19th-century British literature. Internationally renowned for having formed an exceptionally comprehensive collection of 20th-century English and American poetry, Raymond Danowski also built an impressive collection of works by and about William Blake. We are deeply grateful to the Danowskis for designating U.Va. as its permanent home, and for continuing to augment the collection. The engraved frontispiece and title page to Robert Blair, The Grave: a poem (London: T. Bensley for R. H. Cromek, 1808), illustrated by William Blake. The portrait of Blake at the age of 48 was engraved after a painting by Thomas Phillips. Few of Blake’s contemporaries displayed genius as wide-ranging as his. Although mostly self-taught, Blake was admired for his outstanding poetic gifts. Yet because his verse was self-published in a small number of copies, it was little read during his lifetime. As an artist, Blake was an innovative master of several media: engraving, etching, wood engraving, drawing, watercolor, and tempera painting. He was best known in his own day as an engraver and etcher of book illustrations, in particular for his designs to Edward Young’s Night thoughts (1797) and Robert Blair’s The grave (1808). Perhaps Blake’s greatest achievement as an engraver was his Illustrations of the Book of Job (1826), though like many of his publications, it was not a commercial success. Frontispiece to William Blake’s illuminated book, Europe: A Prophecy (1794), reproduced from the 1969 facsimile edition printed by the Trianon Press for the William Blake Trust. It was in the so-called “illuminated books” that Blake found an ideal medium for his singular genius. Blake’s intense spiritual life—what some contemporaries considered madness—found expression in verse and unforgettable images which Blake drew in reverse on copper plates, etched in relief, printed in colors, and then hand-illuminated with watercolor, paint, even gold leaf. It was a process under his complete artistic control, a process which empowered him to publish copies on demand. Sadly, demand proved to be slight. Part of the fascination of William Blake is the process by which he has steadily, but unevenly, risen from obscurity to universal fame. Though his literary and artistic output was not overlarge, many have found something irresistible within its singularity and diversity. So it was with the Pre-Raphaelites, who admired Blake’s verse and his uncompromising artistic vision in the face of prolonged adversity. Later audiences have warmed to his brilliant images, his mysticism, and the challenge of comprehending the abstruse philosophy enshrined in Blake’s illuminated books. 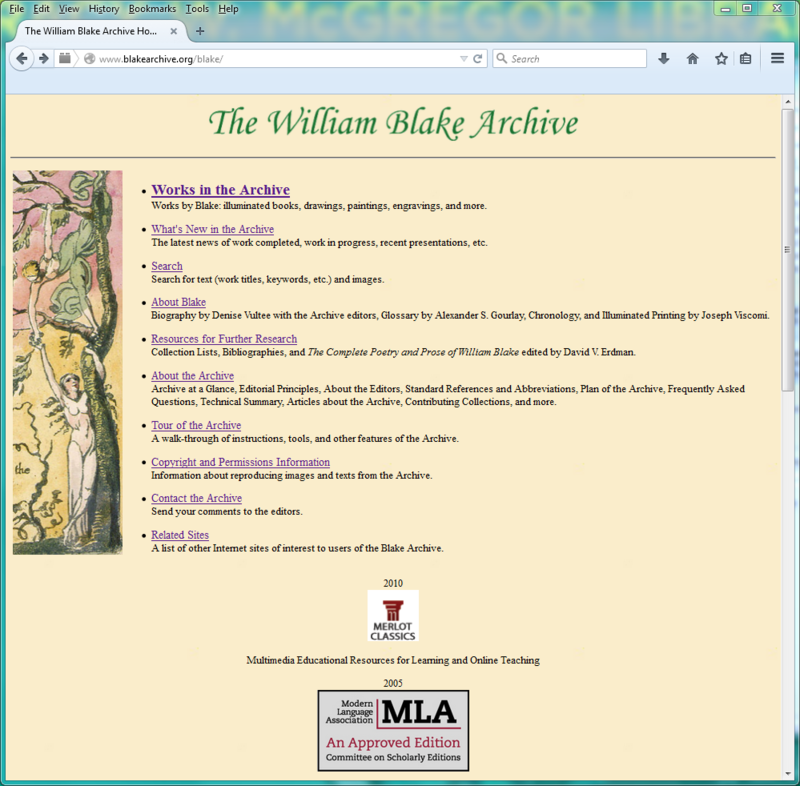 Home page of the William Blake Archive (www.blakearchive.org), a comprehensive online resource for Blake studies. A pioneering effort in the digital humanities, the website was launched in 1996. U.Va.’s Institute for Advanced Technology in the Humanities (IATH) has provided significant technical assistance for the site since 1993. Blake has long been a magnet for scholars who, over the past 150 years, have made substantial progress in solving the puzzles presented by his life and art. 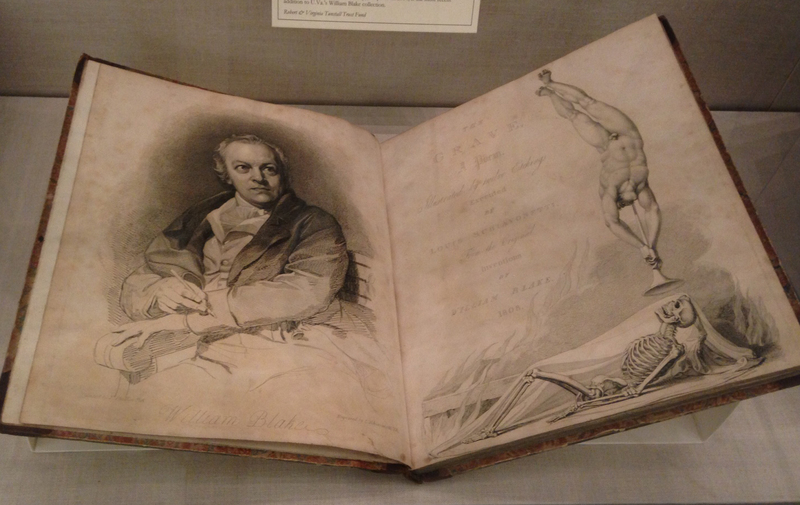 Despite a paucity of primary sources, we now know far more about Blake’s life and his innovative artistic methods. Through the labors of Sir Geoffrey Keynes and others, it is likely that nearly all extant copies of Blake’s illuminated books, as well as his drawings, watercolors, paintings, and commercial engravings, have been located and cataloged. Many of these are now accessible in faithful color facsimiles. A multitude of scholars have delineated Blake’s philosophy and debated its meaning. And through advances in the digital humanities—particularly those made at U.Va. 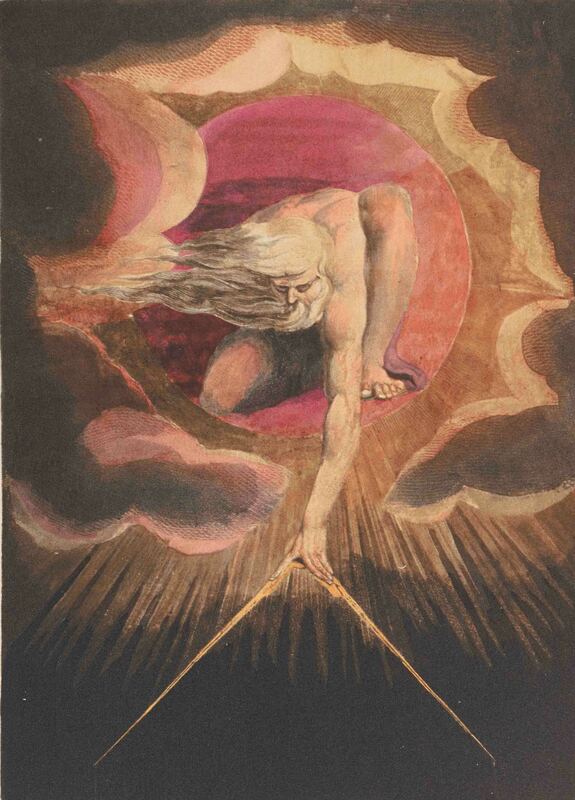 over the past two decades—we now have, in the William Blake Archive and other online resources, powerful tools for envisioning Blake in ever new ways. The exhibition, which is open Monday-Thursday 9 a.m.-9 p.m. and Friday-Saturday 9 a.m.-5 p.m. (with occasional exceptions), will remain on view through May 3. This entry was posted in Exhibitions and tagged book illustration, engraving, etching, illumination, printmaking, Raymond Danowski, watercolor, William Blake by David Whitesell. Bookmark the permalink.